My name is Kathy Day RN. I am a nurse and I am the daughter of a MRSA victim. John P McCleary, my father, died on Janaury 9, 2009 because of Hospital Acquired MRSA pneumonia. He was 83 years old. He fell on Septemeber 26, 2008 and fractured his fibula, the small outside bone of the lower leg. It was a minor fracture that didn’t even require a cast or splint. He also had a urinary tract infection and was treated for that. He had chronic lung problems, but he had never been hospitalized specifically because of that. He was kept in the hospital for 12 days for physical rehabilitation. He worked through his pain from the fracture and he managed to get back on his feet. On October 7, he was discharged home and walked into his home on his own with a walker. On October 9, he couldn’t get up from bed. He had fever and profound weakness. My 82 year old mother had to call the ambulance to return my Dad to the hospital. In the ER, he was worked up with lab, xray, and urine tests. His admitting diagnosis was Left upper Lobe pneumonia and possible heart problems. On October 10, the illness stressed Dad so much that he did indeed have a heart attack. His blood pressure dropped dangerously low. He was transferred from his regular bed to an ICU bed for blood transfusions, monitoring, urinary catheterization, and O2 Saturation level monitoring. He was so weak he could barely sip water from a straw. He spent several days in the ICU. When the nurse put his urinary catheter in she told me “he will get an infection”. It was a statement, not a guess. I was so worried that Dad would get bedsores from being wet with urine that I kind of dismissed that comment. Within 2 days, he had a urinary infection. He had clear urine on this second admission. He not only had an infection, he had a MRSA infection. In the meantime, he had been coughing up large amounts of sputum. I asked if they intended to culture his sputum. The nurse went to check with the doctor and came back to hand me a specimen cup to obtain the sample myself. I did. Two more days passed before the culture came back positive for MRSA pneumonia. Dad had that infection in his lungs on admission. He had passed his infection to his hands from handling his sputum, onto his catheter and up into his bladder. My family,Dads vistors, all of the staff, and everybody else who came in contact with my father before the MRSA pneumonia diagnosis, were exposed to MRSA. Had the doctor ordered a nasal culture for MRSA screening purposes on admission, my father would have been on the correct precautions from the beginning. Also, because he had fever, and had just been in the hospital, had high risk factors, and showed pneumonia in his lungs, the doctors should have been able to piece together the fact that Dad had MRSA in his lungs, or at least suspected it. To go back even further than Dad’s infection, if the hopsital had observed the CDC recommendations for follow up of MRSA outbreaks, Dad might not have gotten an infection in the first place. There had been 2 MRSA deaths just one month prior to Dad’s admission and yet the hospital still did not MRSA screening of patients. My father spent another 20 days in the hospital. He was very weak and debilitated. He got thrush from the Vancomycin. He also had an allergic reaction to it and got an itchy rash all over. His skin began to break down. He was unable to eat. This was the most disturbing part of his disease. His inability to eat was frustrating to him and to his family. He rapidly became malnourished frighteningly thin. He lost most of his hearing, again from the Vancomycin. Ototoxicity is what that is called. He expressed the will and desire to live and get better, but it was just not possible. Toward the end of his hospital stay, he was given the unfortunate news that he would be transferred to a nursing home. He needed total bed care and my mother and I weren’t able to give that at home. He was never able to stand or walk again. Attempts were made at the nursing home by a physical therapist to get him back on his feet, but he had syncopal (severe dizziness) episodes…he nearly passed out. He didn’t have a foot under him. So, he spent his last 2 months of life in an isolation room, unable to hear, eat or enjoy anything. He was on constant oxygen and he needed assistance with simple movements. The skin on his sacrum broke down and it began to break down on his heels, toe tips and shoulder blades. All of my family and his other visitors had to wear masks and gloves, so he couldn’t read our lips or see us smile. We couldn’t kiss him. He was frustrated and confused by this sudden decline in his health. He absolutely HATED being in the nursing home. He had no idea about the fight it took to get him in there instead of 30 to 70 miles away. The day he was to be transferred to the nursing home, which is about 5 minutes away from my parent’s home….we were told there was no bed available. A bed had been promised to us for a full 2 weeks. My mother was self pay, which made it easier to get a bed in the nursing home. When I was told that the bed was no longer available, I called the nursing director of the home. I was told all sorts of nonsense about how they had an “emergency” admission and now there were no male beds left, etc etc. I told them that was totally unfair and I would speak to the director, the medical director, the infection control nurse, the owners and the Governor of the State of Maine if that is what it took to get my father into his hometown nursing home. It took an entire afternoon of staff meetings at that nursing home, but he got a bed. We had to meet 3 demands. One was Dad had to pass the usual Gould assessment test. The second was that Dad would have to wear a mask if he ever left the room there. And third and most unusual, he had to accept Hospice care. He never did accept Hospice. Neither he nor my mother were interested in Hospice and that is a very personal decision. After the fact, I have since learned that it is against the American with Disabilities Act to descriminate against a patient with MRSA, the same as it is for a patient with HIV/AIDS when it comes to nursing home admission. My father spent 2 very lonely sad months in his isolation room at the nursing home. My mother visited him faithfully two or three times a day. We decorated his room to make it more comfortable, but it wasn’t home and that is what Dad wanted…to go home. It would never happen. Ironically, his mother, my grandmother, died in that same nursing home room 33 years ago. My mother received a call on January 9 around midnight. Dad had taken a turn for the worse. The doctor also called me. Mike, my husband and I drove 70 miles to the nursing home. My mother and I comforted Dad all night until his respirations slowed and then stopped at 450 am. This was the saddest experience I have ever had in my life. Dad was coherent and alert until almost the very end. The end was peaceful and he knew we were with him and we were ready to let him go. He had wasted away to around 125lbs by the time he passed. He had lost well over 50 lbs. He barely resembled the big handsome Irishman we had loved all our lives. MRSA had killed my father. The MRSA came from his trusted community hospital. The treatment for his minor ankle fracture shoule have been simple and short term. My anger and frustration over this preventable illness has motivated me to do something about it. Doctors told me “it happens and there just isn’t much we can do about it” “Precautions are a nursing thing” (as if it is impossible for a doctor to become contaminated and spread the disease). There was a lot of expressed helplessness and “I don’t know” answers to my questions. I just couldn’t accpept that. I am from the old school of nursing. Strict sterile technique and precautions were taught and there was NO LEEWAY. Nurses could not pick and choose which parts of precautions they would use. There was a set of rules for certain diseases and that is what we did. Precautions in my fathers hospital were very inconsistant. They ranged from some caregivers not even washing their hands , to others using full fledged precautions…according to who his nurse was any given day. Also, the hospital did absolutely NO admission MRSA screening. So, it is likely that he was roomed with somebody else who had MRSA. Three of my father’s 5 roommates during his first hospitalization have died, and all three had respiratory issues. I strongly suspect that he contracted MRSA from an infected roommate. If not, then he contracted it from unwashed contaminated hands or dirty equipment. In any case, his hospital is responsible for is infection and therefore his death. I contacted the CDC in the State of Maine. To my surprise, MRSA infections are not a reportable disease in Maine. Chicken pox, measles, TB, venereal diseases and avian flu (no cases of this have been contracted within the US) are all reportable diseases. MRSA is not. This allows hospitals to have big or even huge numbers of these infections that complicate patients recoveries or even cause their deaths, and they are not in any way accountable. It is allowed to remain secret. Hospitals even get paid for the extended stays that are caused by these infections. They cost on an average of $25,000 to $50,000 for each patient who becomes infected. MRSA infects skin, blood, organs, body cavities, surgical wounds, bone, lungs, central line sites, and joints after replacement. Infections can be superficial to very invasive. Invasive infections cause disability, amputations, long recovery periods, reoccurance of infection and worst of all death, like my father. For years people have died of ’staph’ infections. MRSA is a staph infection but it is resistant to Methicillin which is a synthetic Pennicillin. CDC says there were about 100,000 invasive MRSA infections in 2005 and over 18,000 of them died. Some say, because of the lack of accurate reporting that the number is 8 times that high. In any case, there are more deaths from MRSA than from HIV/AIDS. The numbers creep up every year and the numbers are alarmingly high. I have researched MRSA until my eyes hurt. I decided that Maine needs a MRSA legislation. Illinois and several other States have such legislation and it has helped to decrease their infection numbers. Jeanine Thomas, of the MRSA Survivors Network, has been very helpful to me in my endeavor to write and submit a MRSA prevention proposal to the State legislature in Maine. Adam Goode D-Representative, Bangor, ME, is my chief sponsor. He has worked diligently gaining support for this proposal. I have called and written to numerous Senators and Representatives in the State to rally them and their support. I have met absoluetly NO resistance to my proposal. Maine State Nurses Association is endorsing me and will lobby on my behalf in the Legislature. AARP of Penobscot County has also supported me. This legislation is past due. Every health care consumer should be concerned about the safety of our hospitals. My proposal includes the major steps to MRSA prevention. Screening, Precautions, Isolation, Reporting, Education, and non descrimination are all the important factors in this proposal. The citizens of Maine and their representatives will make this bill a law. Please contact your local representatives and Senators to support the McCleary MRSA Prevention bill. In order to get my MRSA proposal for the State of Maine out there, I have taken several steps. My first step was to contact State Representatives and Senators. Adam Goode D-Representative of Bangor, ME has expressed the most interest and decided to sponsor my proposal. He also works in advocacy at his regular job with Maine People’s alliance. He in turn promoted my proposal in the House and the Senate. I have also written and phoned many members of the House and Senate to make them aware of my work and why I am doing it. The majority of those I have managed to speak with are fully supportive. The steps for making a proposal a bill and then a law are all new to me. This is not the usual “nursing” type of thing that I have done in the past. I am learning a great deal in this process. I also emailed and phoned organizations for their support. AARP of Penobscot County and Maine State Nurses Association are supporting my work. I will meet with the Maine State Employees Association soon. They are the biggest union in Maine. I will speak to any and all organizations who are interested in making Maine hospitals cleaner and safer. I hope to target the elderly, since they are the most vulnerable. This work is what I am doing instead of just staying mad. I am not funded by any organization or individual. I started the work alone, but I hope to gain support for what I believe is very important to Maine health care consumers. I want patients in Maine Hospitals to be confident that they won’t have to suffer like my father did. I was frustrated and angry about what happened to my father. My anger led me to this passion to make a difference. I do not believe that hospitals are helpless in this. All of the research, recommendations and information is out there about MRSA control. Unfortunately, it is NOT ORGANIZED or MANDATED. There is too much gossip and not enough fact circulating in hospitals amongst care givers and patients. Simple inexpensive, standardized and organized steps can help hospitals to avoid spreading MRSA inside their walls. Every hospital large or small in Maine needs to be on the same page with MRSA prevention. The days of “evidence based” steps for MRSA control are over. The only evidence needed is the alarming increase of MRSA infections and deaths in our hospitals. My father is now on the data……..Data does NOT prevent MRSA. Dad is not a number. He was my affectionate, loving and generous father. Simple steps at his hospital could have prevented my father from contracting MRSA pneumonia while he was rehabilitating from a minor injury. Anybody reading this page can help me to get the word out. Send my webpage to everybody on your email list. Call or email your Senators and Representatives. Help me to help others to avoid needless suffering from MRSA infections. Email me at Mammy1111@aol.com if you would like me to speak to your group about MRSA prevention and my proposal. When I worked as an Employee Health nurse in the early 90s, I worked in close contact with the Infection control department. If an employee stuck themselves with a dirty needle, we had a needlestick policy that we followed by the book. This policy was to help protect employees from diseases such as Hepatitis B or HIV/AIDS. Also, if a patient was admitted and found later to have an infectious case of TB or meningitis, follow up for all exposed employees ensued. TB testing for everybody who had unprotected exposure to the patient was done and followed up. If the patient had Meningococcal meningitis, employees who had cared for and had unprotected exposure to that patient were offered prophylactic medicine to prevent them from getting the disease. My major project as one of the EHS nurses was to test for TB. TB had made a comeback of sorts since the spread of HIV/AIDS. New more difficult strains of TB had emerged in part because of the vulnerability of immunocompromised HIV/AIDs patients. I was assigned the daunting task of testing every employee at my 450 bed hospital for TB with a two step testing process. It took almost 2 years to complete this task. I was also responsible for teaching TB precautions and to do TB HEPA filter mask fit testing for employees. There was a new OSHA mandate to do all of this in the nation’s hospitals. Non-compliance was not an option. Tons of money and many hours were dedicated to all of this testing, mask fitting, education and documentation. In all of my 2 years and around 4500 TB tests, I found 2 new positive TB tests in my facility. That’s right….TWO. Now it seems to me that was a lot of hoopla for a very low number of actual TB cases. I know the importance of TB control. It is a deadly disease and there has been a reemergence of it, but compare it to MRSA. Approximately 15% of the general population has MRSA growing in or on them. About 30 to 40% of healthcare workers has MRSA growing in them or on them. 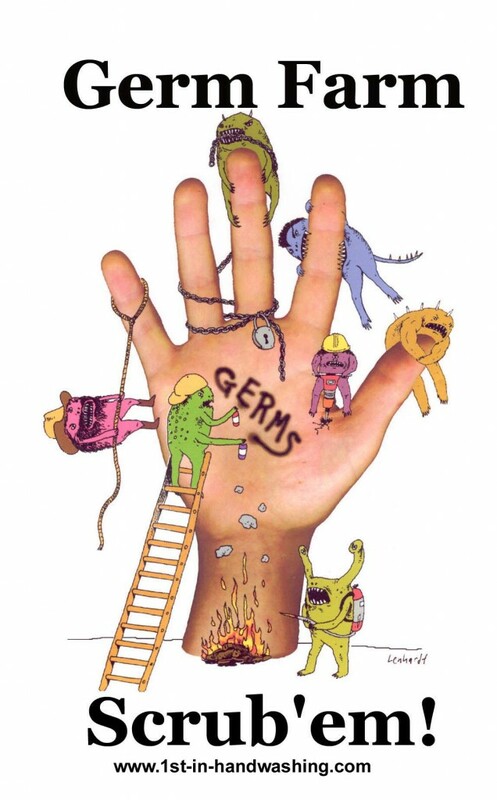 The spread of MRSA is caused by unwashed hands, contaminated equipment or furnishings, or from an infected roommate. If healthcare workers are colonized ( have MRSA in their noses but no signs of infection) then scrupulous handwashing and the use of gloves is absolutely necessary. Other things to consider are healtcare workers wearing rings or other jewelry, long hair hanging around and hovering over dressing and sterile procedures, fake or long fingernails, and wearing the same lab coat or uniform for more than one day. I don’t know any nurses who would knowingly bring disease to a patient. But, if they are not tending to their own hygeine, it is possible. Also, if a nurse becomes ill with a sneezy, ‘runny nose and eyes’ cold, they should be wearing a mask to protect patients. Better yet, they should NOT be working caring for vulnerable patients. Coughing or sneezing can spread not only a nurse’s virus but it seems that the MRSA in the nares could also be shed and spread. Nurses are not routinely cultured for MRSA. Some say it is because there are so many of them with MRSA that there wouldn’t be any left at the bedside. I don’t believe that. I believe that nurses, because of the nature of their work, probably have a higher than normal occurance of MRSA in their noses. But, constant testing and decolonizing them isn’t the answer to the dilemma. Strictly enforced precautions and excellent sterile technique is the answer. There is a time that it is important for nurses to become decolonized and that is if they become patients themselves and vulnerable to MRSA infection in a surgical wound or if another illness makes them high risk. Also, if there is a cluster of MRSA infections in a certain department, it may be necessary for MRSA positive nurses to be decolonized. That is usually a simple procedure of putting an antibiotic cream into the nose for 5 days. Because of hospital acquired infections, I believe it is also time to review our visitors policies in hospitals. It is difficult enough for adults to understand and use precautions. Please don’t bring small vulnerable children into the hospitals and allow them to crawl on the floors and handle equipment. The presence of bacteria is higher in the hospital than visitors know. Brief visits to patients who don’t require isolation may be appropriate, but otherwise keep babies and small children home. The sick patient’s bedside is not the place to bring small children. People in hospitals are sicker than ever and most don’t care to hear loud large parties of people visiting. Bedside nurses will be the ones who reduce MRSA in our State’s hospitals. Maine’s Hospitals will have the mandates necessary to force them to have effective infection control policies that will reduce MRSA infections and deaths. Bedside nurses are also the ones who are closest to and care the most for and about patients. They are our protectors and advocates when we become patients. I want them to be able to decide for me and the others on my hospital ward about visitors, precautions, isolation, and other steps to protect me and other patients from Hospital acquired infections. Their decisions will also protect patients’ visitors. How Can I Protect Myself from MRSA? MRSA (pronounced MERSA), is actually Methicillin Resistant Staphylococcus Aureus. It is a long name for something that only takes a short time to infect the human body. The very young and the very old are most vulnerable. So are dialysis, cancer, nursing home and immunocompromised patients. 2% of S. aureus (STAPH) infections in U.S. intensive-care units were MRSA in 1974, 22% in 1995, and 64% in 2004. MRSA can infect skin, blood, bones, lungs, and organs. It can move from one part of the body to another. MRSA can live up to 3 months on a non host surface if not disinfected. On a host surface (skin, nose, lungs) it can live indefinitely. The two most common MRSA diseases are CA or Community Acquired MRSA and HA or Hospital Acquired MRSA. The two organisms used to differ in their DNA, but recently there seems to be a merging of the two. MRSA infections can disable or kill otherwise healthy individuals. Don’t share towels, razors or other personal devices. Demand that your health care workers wash their hands before contact. Keep frequently touched surfaces disinfected. About 30% of us have Staph in our noses. Ask for a MRSA nasal culture if you are going to have surgery or if you are an at risk hospital admission. MRSA (pronounced MERSA) is Methicillin Resistant Staphylococcus Aureus. It is easy to understand why MRSA is used instead of the long name. The microorganism is a morphed form of Staph or Staphylococcus Aureus. Everybody has heard of Staph infections. They have plagued people for many years. Until MRSA, most staph infections could be effectively treated with Pennicillin and other common antibiotics. Around 1960, doctors discovered that some Staph infections no longer responded to regular antibiotics, so they discovered a synthetic “cillin” Methicillin. After too many years of doctors and other prescribers over prescribing antibiotics for viral illnesses and other minor infections, Staph became resistant to Methicillin too. Thus the title Methicillin Resistant Staphylococcus Aureus. MRSA can be contracted inside hospitals and in the community, but it is believed the origin of the infections is health care facilities. Until lately, Community Acquired MRSA had different DNA than Hospital Acquired MRSA. It is feared that the two are merging. HA MRSA accounts for about 70% of all Staph infections in hospitals now. Staph infections are the most common HA (hospital acquired) infection. It invades all soft tissue, organs, bone, blood, lungs and airways, nose, throat and ears. Many (approximately 30%) of us carry MRSA in our noses. We have healthy immune systems and so it does not cause symptoms of infection, such as fever, swelling or malaise. If for some reason we become vulnerable to infection, such as after a serious surgery, we can spread our MRSA from the nose to a surgical wound. Pre surgical nasal cultures for MRSA can help all of us to avoid such a disaster. Many thousands of serious surgical site MRSA infections have caused patients unnecessary pain and extended recovery periods. Some get MRSA in their blood streams and they can die. Once MRSA becomes invasive, it is very difficult to get rid of. Amputations are sometimes necessary. Other common sites of MRSA are in Central line IVs, urinary catheters, lungs after tracheotomies or intubations, and in joint replacements. High risk patients such as Cancer patients, dialysis patients, Long term care patients and others should always be screened when being admitted to the hospital. All Pre surgical patients should also be screened. People with known previous MRSA infections and their caregivers should also be screened. If those screening cultures are positive, there is a simple treatment for it. Bactroban cream is put into the nose a few times a day for 5 days and then sometimes the patient is recultured. They are also given Chlorhexidine (Phisohex or Hibiclens) baths once day. During that time, it’s best to avoid procedures that could introduce MRSA into deeper parts of the body, unless it is an emergency. It is also best to isolate people who are positive for MRSA in their noses or other places. MRSA is spread to patients in hospitals by hands or by contaminated equipment. The method of spread of MRSA is contact and droplet. This means that if a patient is coughing and has MRSA in their lungs, MRSA can be propelled by a cough up to 3 feet from the patient. The droplets will contaminate all of those surfaces. Health care workers must use contact precautions AND respiratory precautions when caring for patients with MRSA in the lungs. Caregivers and visitors must use both gloves and masks. If MRSA is in wounds or on the skin, contact precautions (handwashing and gloves) are sufficient. Contact Precautions are as follows. Before and between contact with patients, the caregiver, or other persons entering the room, must wash their hands with soap and water, or use an alcohol bases hand cleanser. Then non sterile gloves must be worn. If the caregiver is going to be handling any wet bedding or have close touching contact with the patient then a gown must also be worn. The germ can get onto caregivers and visitor’s clothing and be spread to other patients. The hands must be washed and new gloves and gown put on before contact with another patient. All frequently used items such as a blood pressure cuff, thermometer, IV poles or pumps, must be assigned to MRSA positive patients and not shared with non infected or non colonized patients. If there is lung invovlement or there will be spraying of infected bodily fluids, a mask must also be worn by the caregivers/visitors. MRSA is considered an infection when the patient has active signs of infection to include fever, malaise, purulent (pus) drainage, swelling, redness, and other signs of active infection. My father was treated for his infection and then given the sad news that he would always be colonized in his lungs. This means the bacteria never goes away and he could become ill again with infection at any time. Because he had MRSA in his sputum and for the rest of his life, he still needed to stay on respiratory and contact precautions. We wore masks and gloves every visit until he died. MRSA is a persistant, invasive and a potentially deadly disease. In Maine Hospitals are not required to even report these hospital acquired infections to the State CDC. The purpose of CDC is to Control Disease. If they are not given the numbers of these infections, how will they know where to concentrate their efforts to control the spread of the disease? Part of my proposal will be to require all hospitals in the State of Maine to report these infections, and if they were present on the patients hospital admission or if they acquired it while hospitalized. This will make hospitals accountable for infections that they spread to vulnerable patients. Publicizing this information will also allow health care consumers a way to make wise health care decisions for themselves and their families. MRSA can be controlled. The VA hospitals all over the country require ever single hospital admission be screened, and they follow the other steps I have included in my proposal. It has been successful enough that they will now expand their program into VA Long Term facilities. Contact your local senators and representatives to support the McCleary MRSA prevention bill, now known as Maine LD 1038.